LOS ANGELES -- Electric car maker Tesla Motors Inc. said its third-quarter loss nearly doubled, and it reported a tentative agreement to supply a powertrain for an electric Mercedes-Benz model. The company, which is named for inventor Nikola Tesla, posted a net loss of $65.1 million for the July-September period, up from $34.9 million a year earlier. "Even though they're losing money, the fact that their batteries are attractive to other automakers gives them some revenue and some credibility," said Alan Baum, an industry consultant at Baum & Associates in Michigan. "They are catching a few breaks in the sense that people want to do business with them." Tesla is sold out of next year's production of its new Model S sedan and should earn a profit in 2013, CEO Elon Musk said in an Oct. 28 Bloomberg Television interview. The electric sedan will retail for as little as $50,000, half the price of its current Roadster sports car. The automaker said in a letter to shareholders it had a "letter of intent" from Daimler AG for "a full powertrain in the Mercedes line." Details of the program may be announced "around the end of the year," Musk said on a conference call Wednesday. Tesla's third-quarter revenue totaled $57.7 million, higher than the $46.4 million average of eight analysts' estimates. The company raised its 2011 revenue forecast to $195 million and $200 million from $180 million to $190 million, crediting sales of Roadsters and motors and battery packs to Daimler and Toyota Motor Corp. Excluding some items, the third-quarter loss was 55 cents a share, Tesla said in a statement on its Web site. The average of nine analysts' estimates compiled by Bloomberg was for a per-share loss of 60 cents. Tesla said it's on target to begin delivering electric Model S sedans next year. Sales of Roadsters, which cost more than $100,000 each, jumped 22 percent to 184 units in the quarter. Revenue from the model that travels more than 200 miles per charge was "just over $28 million," the company said, up 56 percent from a year ago. 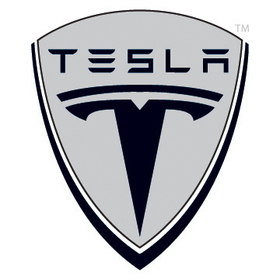 Tesla counts Daimler, Toyota and Panasonic Corp. as investors. The Model S is an important part of Tesla's plans to break into profitability. "Our Roadster owners have now driven their cars 16 million electrically powered miles, the equivalent of traveling to the moon and back over 30 times," Musk and CFO Deepak Ahuja said in the letter to shareholders. "This experience will pay great dividends when we bring the Model S to market."